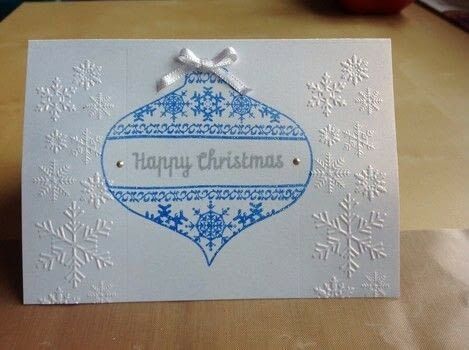 https://www.cutoutandkeep.net/projects/cas-christmas-2 • Posted by Gemma T.
This is a one layer card so it is easy to make and is good for making several the same as you do at Christmas. Score to make a A6 card. Use an embossing folder to emboss either side of the front of the card. Stamp an image in the centre of the card, cover with sparkly embossing powder and heat emboss. Stamp a sentiment then put a little bit of liquid pearls at either side. Add embellishments but do so sparingly so the card remains clean and simple.